Yesterday, saw an amazing Super Bowl match up between the Atlanta Falcons and the New England Patriots; and what a game it was! People are already calling it the “greatest” Super Bowl ever and we couldn’t agree more. 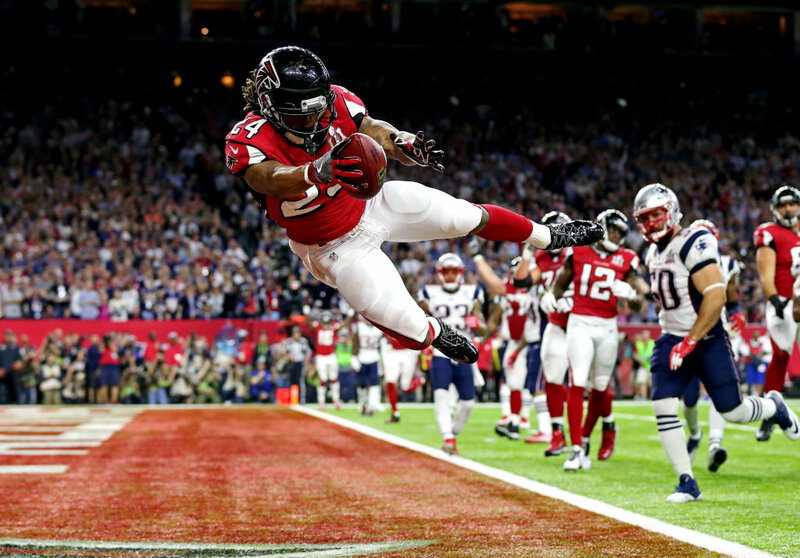 The Atlanta “Dirty Birds” Falcons being the listed underdogs before the game, gave the Patriots a real tough Super Bowl, with their fast running backs, collecting lots of running yards and controlling the game from early on with the New England Patriots, seemingly unable to stop their runs from slipping through the lines. In the second quarter, Atlanta was 14-0 up after two early touchdowns. The New England Patriots looked devoid of anything to stop the seeming massacre of this once great team, the New England Patriots. The Patriots picked up a few spare points, but the Falcons kept on scoring touchdowns. Let’s be honest, legendary Quarterback Tom Brady had been the subject of a witch-hunt in recent years with the whole “Deflategate” debacle, since January 18th, 2015, when the Patriots were accused of under inflating footballs’ against the Indiana Colts. That whole thing went on for quite a while and seeing it from the outside, we always thought that this was completely ridiculous. This was a witch-hunt against one of the greatest Quarterbacks to ever play the game, Tom Brady, so how did they manage to come back from 3-28 in the third quarter? “Amazing!” as Tom Brady slowly came into his own, seemingly waking up and throwing completed pass after pass, approaching the Falcons end zone from the second half of the 3rd Quarter with renewed ease all of a sudden, but failing to get any touchdowns, just yet. Our only justification for this miracle, could be that it was the wish of the American Football Gods or Football Karma if you will, for putting Tom Brady through “Deflategate” with all the media against him and also for the media chastising him for being a friend of Donald Trump, so could this have swayed the fate of the final result? You could definitely say, that this Super Bowl was feeling like it was about a lot more, than just football. It was almost as if the Patriots represented the Republicans and the Atlanta Falcons, represented the Democrats in hindsight, with the irony being in that “Patriotism”, in the U.S. had been put into major question over the past six months, due to the American political landscape since the rise of Donald Trump and the fall of Barack Obama, with numerous unjustified violent protests and liberal mass media smear campaigns and fake news against Donald Trump and even with “Deflategate” against Tom Brady, over the past 18 months. This Super Bowl felt like it was about a lot more than just American football, to us. If the New England Patriots, represented “Patriotism”, then when they got their first touchdown by James White, diving into the end zone, to get the score back to 9-28 in the 3rd Quarter with only 02:06 on the clock, surely that touchdown would be nothing more, than just a consolation touchdown and there was no way back. At the start of the 4th quarter, the commentator said, “It would be an unprecedented comeback if the Patriots climb out of this hole, to win their 5th Super Bowl”. But, the American Football God’s must have truly been with the “Patriots” because the come back was already on the way, even if we didn’t know it yet. Donald Trump was watching with Melania, but reportedly he left the Super Bowl viewing party in Miami, half way through the third quarter, amidst issues with the temporary immigration ban being upheld, as we know he was watching from the Trump International Golf Club in West Palm Beach, Florida. Trump would miss the comeback, as did we, thinking that the game was over. But, how wrong were we, as things began to materialise almost like “magic”? The Patriots kicked a Field Goal on 4th down, to make the score 12-28, with the Atlanta Falcons still holding a 16 point lead in the final quarter with just 9 minutes to go on the clock. Tom Brady began completing passes to his receivers with the clock ticking with just over 7 minutes to go, then it happened, another 1st down after a catch from Mitchell, with 6 minutes to go, the Patriots were approaching the end zone. But, how in the hell would they win this game, even after the touchdown by Amendola, to take the score back to 18-28, with just 5:56 minutes to go? They decided to play for the two point conversion to play catch up and James White, ran it into the end zone, to make it an 8 point game, making it 20-28, with just over 5 minutes on the clock. Tom Brady was heating up, almost as if some sort of “Deflategate” justice was on the way. Tom Brady and the Patriots weren’t giving up and they needed only one touchdown to tie the score and bring it into overtime, with only 4 minutes left on the clock. A humongous sack of Atlanta Falcons QB, Matt Ryan by Craig Flowers, created a shift in the game with less than 4 minutes to go. The Falcons conceded a turnover and had the Patriots back to their 10 yard line, after incomplete passes, then punting to put Brady back on the ten yard line with 3 minutes to go, so with Brady at 3rd and ten, he managed to get the Patriots out of trouble with a crucial pass to Chris Hogan, to take them up to their own 25 yard line. On 2nd and 10, Brady began finding WR Malcolm Mitchell and then followed by Julian Edelman’s insane catch, to put the Patriots in a commanding position, in the Falcons own 25 yard line, with the commentators’ tone changing to knowing that the Patriots would need one touchdown and a two point conversion to tie the score. So, what does Tom Brady do? He utilises running back James White in the pocket, with a deft pass, taking the Patriots to 1st & Goal, followed by another short pass to White, bringing him to the one yard line. Wohuu! Next what we heard, was a play, maybe called “Alabama”, with James White getting the pigskin dished off to him by Brady and jumping through the end zone, to score another touchdown. The score 26-28, and Patriots needed a two point conversion with 00:57 seconds left on the clock. Suspense! Brady picks out a side pass to Danny Amendola, with a flag on the play for offside by the Falcons, which gains Patriots the two point conversion. Patriots even, at 28-28! What a comeback from Brady and the boys! Do not underestimate Tom Brady, who was gunning for this 5th Super Bowl, taking the first ever Super Bowl to overtime. What happened in overtime? Well, after the coin toss, it was the Patriots turn to receive. So, Brady picked out a pass to Amendola to get a 1st & 10 on their own 45 yard line, followed by another amazing catch by Chris Hogan from Brady’s pass, landing the Patriots on the Falcons 40 yard line. Then it was 1st down on the Falcons 25 yard line, with Brady finding Edelman in the pocket again, then Brady gave it to James White, with a short pass and run, bringing the Patriots to the Falcons 15 yard line. Brady’s next pass to Marcellus Bennett gave them a flag for “pass interference” and Patriots were now on 1st down and 1st & Goal. The Patriots now had the chance to lead for the first time in the Super Bowl and also to win it, after almost losing it all with a risky pass, which was impeded by Vic Beasley, before James White converted the touchdown with a dive into the end zone, like a rugby player, to win the the Super Bowl 34-28. Incredible scenes of celebration ensued! What a comeback and what a sudden death victory for the Patriots! It seemed like “Patriotism” won and Tom Brady was named MVP. Buy yourself an official Tom Brady Jersey here.